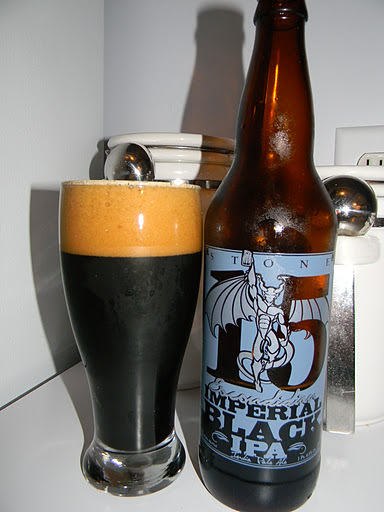 Review of Stone 15th Anniversary Black IPA | Beer Apprentice - Craft Beer News, Reviews, Interviews and Info. For today’s craft beer review I’m going to be sharing with you my tasting experience of the Stone 15th Anniversary Escondido Imperial Black IPA produced by the Stone Brewing Company located in Escondido, California. This brew has been one of the most talked about beers of the year, so I figured I better give it a go. Let’s see what the website, stonebrew.com, has to say about this brew. In the 15 years since we entered the craft brewing world, change has come not in a straight line, but as an exponential curve. The craft brewing movement has long been called a “revolution.” But today the air is so thick with revolution, it’s palpable. No longer is it only an awareness among the faithful; the unconverted are beginning to feel it as well. Denial and ignorance are disappearing in favor of opened eyes, curiosity and the sense that there’s something larger out there. For far too long we have been lied to. For far too long we have been oppressed by the notion that dumbed-down-lowest-common-denominator-mediocrity was all that we could, and should, expect. You might think we’re talking only about the world of brewing, but we’re not. There is a myriad of products out there masquerading as cheeses, coffee, chocolates, breads…hell, there is stuff pretending to be ‘food’ that our great grandmothers would not recognize as such. Yet the craft brewing movement, together with the artisanal food movement, is making much progress. Where the industrial companies can’t dismiss or bury us, they are attempting to copy us with cheap facsimiles. Yes, chances are if you are holding this bottle, you understand these things to be true about the world of brewing. You also likely understand the importance of our fight at Stone against accepted ‘norms’ over the last 15 years. We believed that America was ready to embrace things made with artistry and passion. You have spoken. Your response has been clear. We are not merely consumers to be spoon-fed whatever commodities need to be unloaded for a profit. We have only just begun to move the needle of this revolution, & mediocrity still reigns. Consider that when you reject dumbed down, industrialized food and drink, you also support craft brewing. The line is nearly seamless; we are fighting the same battle. We will not win in our lifetime, as the powers are too entrenched, and the masses too…fooled. And shackled. However, this is a revolution of ideas and of taste, and we will win. How do you want to be viewed by your children, and your children’s children? As a hero, or as the oppressed? (Those that don’t think they have been oppressed are already lost.) Ultimately, it’s up to you to decide. We hope you’ll stand with us. Strong and unyielding. You are needed. This bottle and its glorious contents are a celebration of you, brothers and sisters, and your importance in this fight. Cheers to all we’ve accomplished together in the past fifteen years, and cheers to the adventure ahead! The 15th Anniversary comes in a 22 oz. bottle and it has an ABV of 10.8%. It poured a definite black color with a dark, tan head. The cap was full, of great size, smooth, full and creamy. It supported great retention and some very nice lacing. The head settled to a silky smooth film right on top of the liquid. Absolutely no highlights were present around the edges. The nose revealed plenty of hops. Hints of grapefruit and orange citrus along with some piny and resinous notes. Distinguishable roasted malts with some evidence of chocolate. It also seemed rather “earthy” as well. A fragrance of grain and bread came forth as the brew warmed, which added even more complexity. The taste brought about a good amount of hops with a suitable helping of bitterness. Roasted grains, that seemed almost charred, intermingled with the sweet grapefruit and piny savors. I noticed a smattering of alcohol as well as a smooth chocolate and whole milk tones. Once the brew had time to settle, the maltiness really started to push its way to the forefront. The hops were still present, but they didn’t dominate the flavor as they had with the first couple of sips. The taste was big, rich and bold. The moutheel was medium to medium/full, smooth, chewy and very dry. The carbonation was good and a welcome alcohol burn and warmth was felt at the back of the throat. Suitable amounts of flavor were left covering the palate after the swallow too. Well, I can see why so many people rave over this beer. It’s very good and different. I had to close my eyes a couple of times so as not to be deceived by what I was seeing in the appearance. My mind wanted to smell and taste something completely different than what was shown. This brew was fairly easy to drink considering the high ABV. Honestly, this isn’t my favorite style, but I didn’t have any problem finishing this bottle all on my own. I hope you guys had the opportunity to try this beer when it came out because it was definitely worth it. What’s everybody’s opinion of the Black IPA trend? Do you like them? Feel free to leave a comment if you would like. Thanks for reading and commenting everyone. I, truly, appreciate it. Until next time.